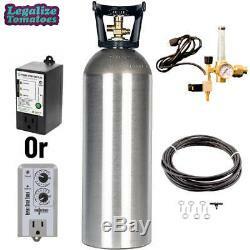 Grow Crew 20 lb CO2 Tank, Regulator, & Tubing Package Combo. Everything you need to start effectively enriching your grow environment with CO2 including a 20 lb CO2 tank, a CO2 Regulator, and 25' of laser drilled tubing. The laser drilled tubing comes with accessories to hang it above your garden so that the CO2 can easily fall onto your canopy for increased growth rates, yield, and heat tolerance for your plants. A complete CO2 Enrichment Kit: Drive your garden to its full potential with this user-friendly, highly effective 20 lb CO2 tank, a CO2 Regulator, and 25' of laser drilled tubing combo. Your plants will grow faster, larger, and more bountiful with the aid of proper CO2 enrichment, and this combo gives you the tools to do it. The combo includes a release kit, which accurately controls the flow of CO2, and a brand new 20 pound aluminum CO2 tank. Tank and regulator combos are the most cost-effective method of enrichment for small and medium sized gardens! Make sure to hang the tubing above your plants as CO2 is heavier than air and will fall from where it's emitted. Another option is to have the CO2 emitted directly into a fan blowing onto your plants. 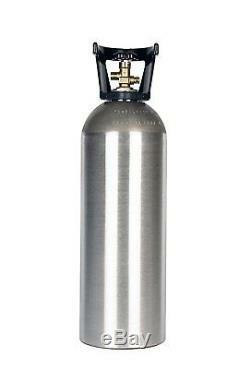 The 20 pound aluminum tank is brand new, and perfect for use with our CO2 regulator. Aluminum tanks are about 1/2 the weight of standard steel tanks and do not rust or corrode. 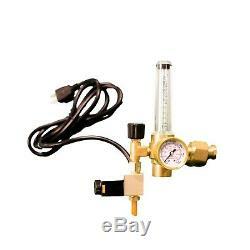 CO2 Regulator w/ Flow Meter - REG-1. The CO2 Release Kit provides you with the tools you need for proper CO2 enrichment. The regulator assembly features an industrial-grade 120-volt solenoid valve with 6 ft. Power cord, a precise flow-gauge, and easy-to-read pressure gauge. The kit also includes 10 ft of tubing for dispersal, and connects directly to 20 lb. This simple-to-use equipment will allow you to maintain ideal CO2 levels for optimal growth. Use with a programmable time to manage timed cycles, or a digital CO2 controller (controller recommended). Titan Controls CO2 Rain System - 25 ft. The CO2 Rain System showers your plants with CO2! Just affix the eye screws in the ceiling, slide the black laser drilled tubing through the eye screws, attach the plastic tubing from your CO2 Regulator and you've got CO2 raining down on your plants. This is a very effective and efficient way to enrich your growing environment with CO2! 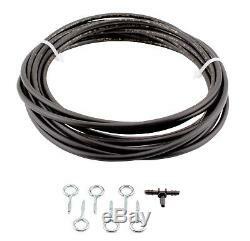 Includes: 25 feet of 3/16" laser drilled tubing, 3/16" plastic (T) fitting, 6 eye screws. Titan Controls - Spartan Series Repeat Cycle Timer. The Titan Controls Spartan Series Repeat Cycle Timer is an easy to use and reliable product. It features a 5 second to 30 minute ON time, a 5 second to 60 minute OFF time and adjustable modes for day, night or 24 hours. Designed to precisely control pumps, CO2 systems and fans. The Titan Controls Spartan Series Repeat Cycle Timer is cULus listed and features a durable plastic housing. 15 Amps maximum/120 Volts/60 Hz. It is recommended that you re-tighten all connections every 60 to 90 days to avoid possible arcing and potential input terminal meltdown. Titan Controls Atlas 7 - CO2 Controller. Select CO2 PPM levels at 1000 PPM, 1250 PPM or 1500 PPM. Enclosure resists dust, rust and moisture. 5 Amps maximum/120 Volts/60 Hz. The item "Grow Crew Hydroponics CO2 Enrichment Kit Tank + Regulator Generator System" is in sale since Thursday, December 27, 2018. 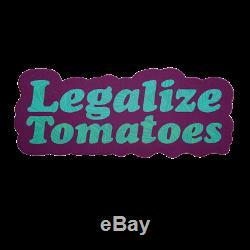 This item is in the category "Home & Garden\Yard, Garden & Outdoor Living\Gardening Supplies\Hydroponics & Seed Starting\Environmental Controls".